Today is the first Friday of the month so here’s your monthly reminder to use your Chase Sapphire Preferred card to pay for your meals today since they’ll offer 3 Ultimate Rewards points per dollar instead of the usual 2 points. Ultimate Rewards are one of my favorite currencies since they can be transferred to so many partner airlines and hotels. Several times I’ve transferred them to Hyatt and then booked rooms that would have cost well over $400 USD per night. Recently a friend transferred her UR points to Virgin Atlantic and then booked a flight to Australia on Virgin Australia for $28 in taxes. That same flight costs just over $1000 right now! The Sapphire Preferred card also earns 2 points per dollar on all travel expenses so that $28 charge for airline taxes will earn my friend 56 Ultimate Rewards points. 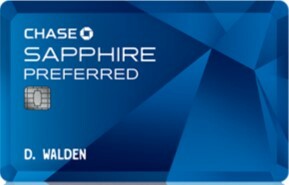 Plus, the Sapphire Preferred has no foreign transaction fees and it does have chip + signature technology. Sign up now and get 45,000 points after spending $4000 in the first three months. You can get an additional 5000 points for adding an authorized user. The annual fee is $95 but it’s waived for the first year.